In the bowl of a stand mixer, add both of the flours, salt and butter. Using the paddle attachment, mix the ingredients until the butter is the size of crumbs. Stir in yeast mixture and 1 beaten egg. Run the mixer on medium-low speed until a dough forms and pulls away from the sides; be patient, this will take about ten minutes. Shape the dough into a rough ball and return it to the bowl. (I also swipe a lightly oiled paper towel around the bowl before putting the dough back in.) Cover the bowl with a damp kitchen towel and let the dough rise in a warm place until it has doubled is size. This could take anywhere from 1-3 hours, depending on how warm your kitchen is. Check the dough every half hour or so. Line a baking sheet with parchment paper. Once the dough has doubled in size, use a dough scraper or a knife to divide the dough into 8 equal parts. 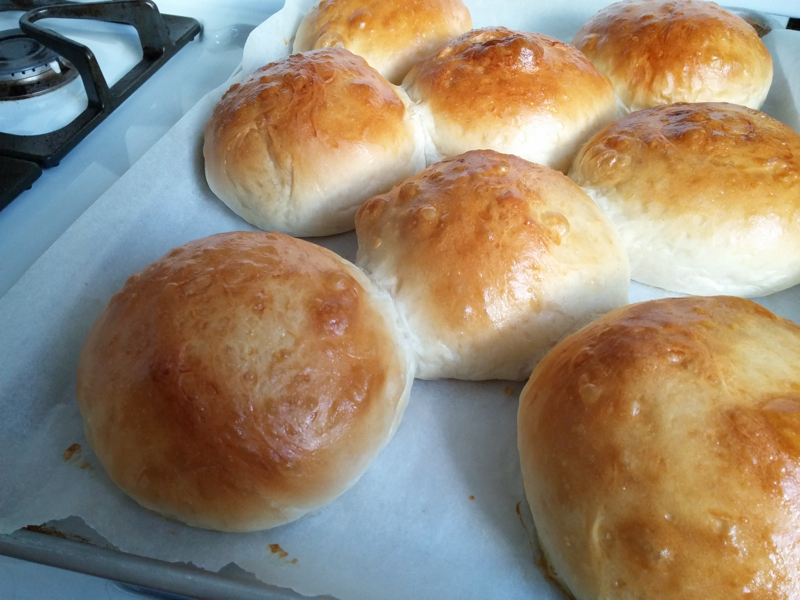 To shape the dough into balls, pull the sides of your dough up towards its center and pinch everything together, flip the ball over and roll it with both hands until it is smooth. (This process is hard to describe in words... here is a great video to show you what I mean.) 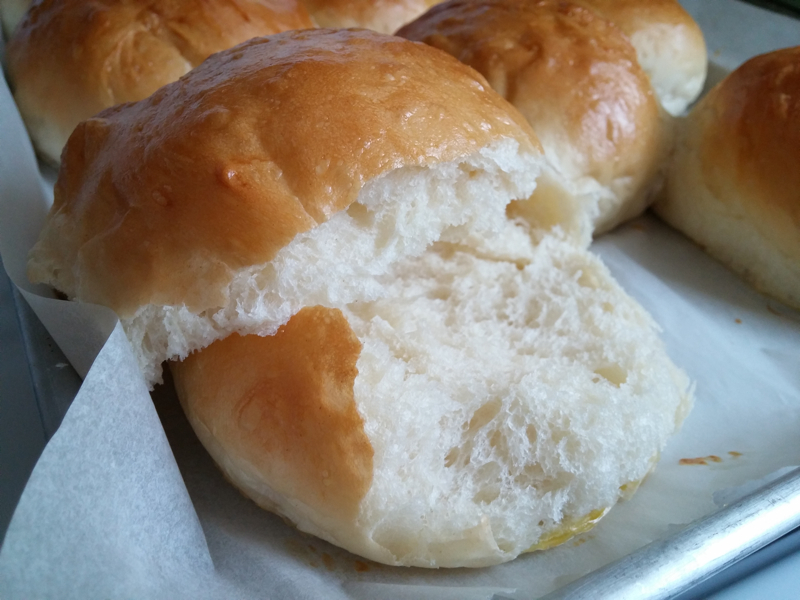 Transfer the buns to a parchment lined baking sheet, placing them 2 to 3 inches apart. Cover loosely with plastic wrap and let them rise in a warm place until puffy, approximately 1-2 hours. They should be a bit smaller than the size you ultimately want them... they will get even bigger in the oven. I actually let mine sit a touch too long and they over-proofed slightly! To make the egg wash, beat the remaining egg with a splash of water. 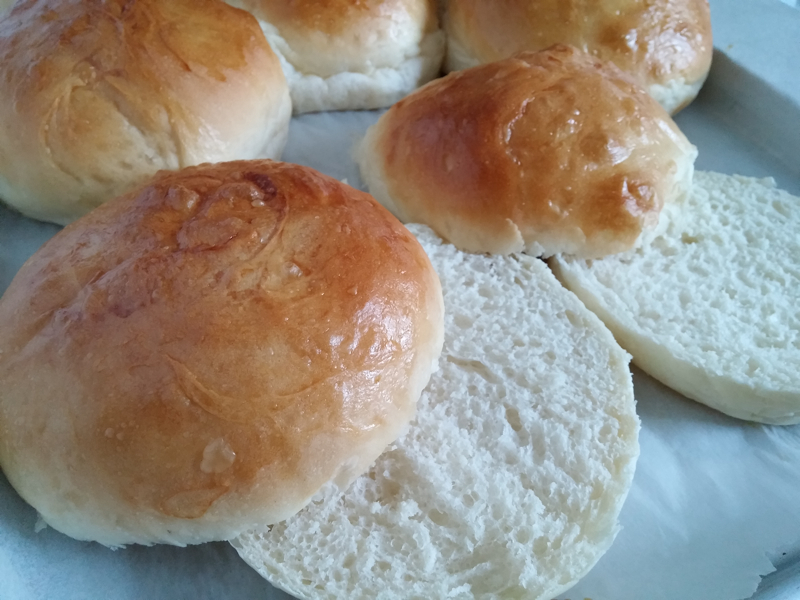 When the buns are finished rising, gently brush them with egg wash. Preheat your oven to 400 F. and place a shallow baking pan on the oven floor. Before the dough goes in, fill the pan with a little bit of water. This will help create steam in the oven, which will help keep the bread moist. Bake until golden brown all around, about 15-20 minutes. Transfer the pan to a wire rack to cool completely. Ok my mouth is watering now, I definitely want to try to make these!